Often we can get focussed on one area of our life and before we know it, other areas of life important to us are not being fulfilled. It is easy from there to begin to feel unfulfilled or trapped. 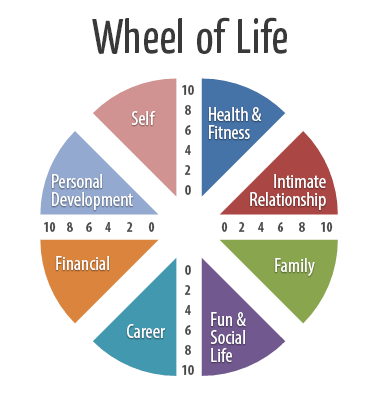 If you were to complete the “Wheel of Life” now, using 10 as highest and 0 as lowest, how balanced would your life be? There is nothing wrong with being out of balance for a short period of time. A young family or tight deadline at work can create this short term. It is when that instability becomes constant that you can start to feel like you are missing out on something or on life in general. Go ahead, print this page and complete the Wheel of Life – where are you experiencing a life less balanced? If you have found one or more areas less balanced then of course the next question is going to be “what are you going to do about it?” Life is on a finite line and it is important to live with that feeling of true life fulfilment. I hear some people say “life is just passing me by”- well it doesn’t have to. Mapping life is a bit like mapping a journey. You need to know where you are going and how to get there. Plan when to work hard, what to work on, when to play and when to simply relax. Goal setting and helping people obtain a more balanced life is a specialty area for me. Sometimes it is just about planning; sometimes it is getting to the root of our beliefs, our limiting thoughts and even fears so we can believe in ourselves more. You are the creator of the clearest map of your life, together we can create the GPS and add more detail, dimension and colour to it for you. Call me now and let’s get started.